This tub-thumpingly French steak dish combines punchy flavours with bags of style – ooh la la. Place the potatoes in a pan of cold, salted water and bring to the boil. Reduce the heat and simmer for 12-15 minutes, or until the potatoes are tender. Drain the potatoes and return to the pan, placing over a low heat for a couple of minutes to dry them slightly. Pass the potatoes through a ricer, then add 150g/5oz of the butter and all of the cream and beat to a very smooth mash, seasoning to taste with salt and freshly ground black pepper. Cover and keep warm. Season the steaks, to taste, with salt. Heat a large ovenproof frying pan over a high heat until very hot, then add 25g/1oz of the remaining butter, the olive oil, and the steaks. Add the halved shallots to the pan too, cut sides down. Fry the steaks for 2 minutes on each side, basting with the melted butter. Do not move the shallots as the steaks cook. Transfer the pan to the oven and continue to cook for 6-8 minutes (for medium), or longer if you prefer your steak more well done. Transfer the pan contents to a warm plate and set aside to allow the meat to rest. Return the frying pan to the hob, wrapping the handle in a cloth so as not to burn yourself, and heat over a medium heat. Add 25g/1oz more of the remaining butter, then fry the chopped shallots and garlic for 2-3 minutes, or until softened but not coloured. Increase the heat to high, add the caster sugar and cook until melted and golden-brown. Pour in the wine and bring the mixture to the boil, then continue to boil until the volume of liquid has reduced by half. Add the stock, return the mixture to the boil, then reduce the heat and simmer for a further 2-3 minutes. Add the snails and cook until heated through. Whisk the remaining 25g/1oz of butter into the sauce, then season, to taste, with salt and freshly ground black pepper. Stir in the chopped herbs. To serve, place one steak onto each of four serving plates. Fan one of the halved shallots on top of each steak. 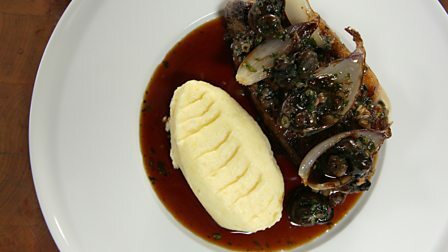 Spoon over the red wine and snail sauce and place the mash alongside.